Galaxy Op. 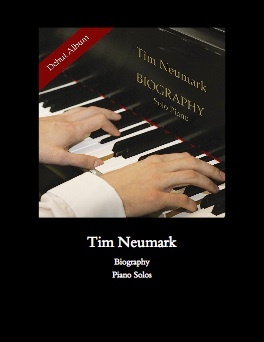 6 songbook is the companion sheet music book to Tim Neumark’s 2015 solo piano release by the same name. 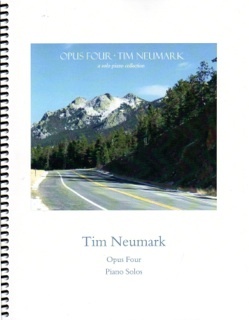 All twelve pieces from the recording are included, transcribed by Zechiel Music Transcription and proofed and edited by Tim Neumark and myself. These are note-for-note transcriptions done directly from the recording. The book is spiral-bound with full-color front and back covers. The paper stock is a medium-weight bright white with print that is clear, crisp and roomy. There are a few passages with a reach of more than an octave, but alternatives are offered for pianists with smaller hands. The collection offers a very nice variety of playing styles from peaceful ambience to darker and more dramatic. 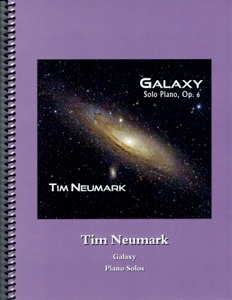 Most pianists at an upper-intermediate playing level will have no problem mastering the majority of these pieces. A few have somewhat more difficult key signatures and are a bit more intricate, but none of them are what I would call difficult. Pedaling suggestions, metronome settings, and dynamics are all clear and concise. I thoroughly enjoyed playing through this book while reviewing it and recommend it! 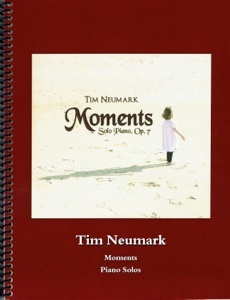 It is available from TimNeumark.com.